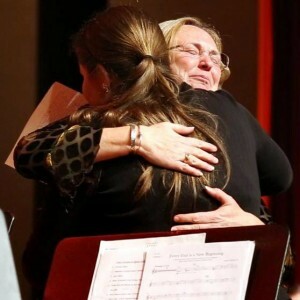 SOUTH DEERFIELD, MA — In musical notation, a coda signifies the end of a piece, and that’s what Thursday night’s spring concert at Frontier Regional School was for long-time band director Karen Atherton, who will retire in June after 28 years with the school. With the help of Atherton’s fiercely loyal students, however, the night also turned out to be something of a refrain. After the wind ensemble concluded its final piece, Andrew Boysen Jr.’s “Every Ending is a New Beginning,” some of the band members gave a speech praising her for her years of instruction and the impact she had on them At the end of the speech, the curtain raised on the night’s big surprise: about 50 former students had traveled from across the country to attend Atherton’s final performance.